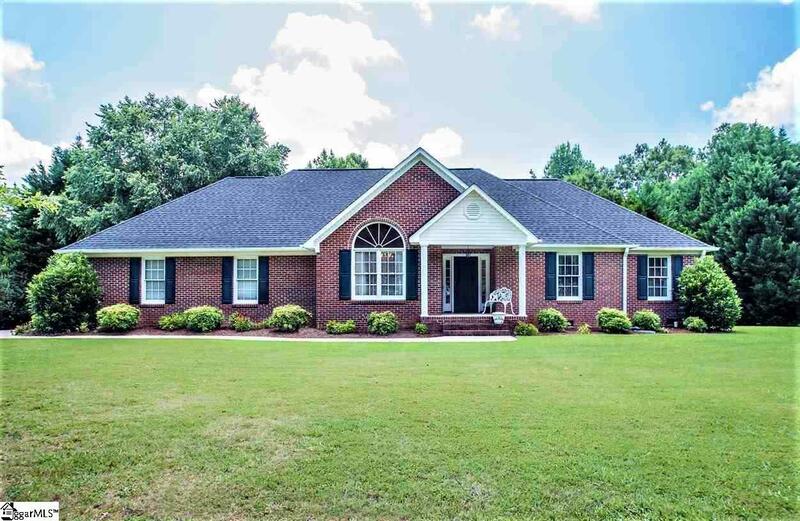 Beautifully maintained 4 bedroom 2.5 bath ranch home on a 3/4 of an acre flat lot in an established neighborhood located in a convenient location, a short distance from shops and restaurants in downtown Simpsonville. Upon entering this home, you are greeted with immaculate hardwood floors that flow throughout the main living areas and master bedroom. Off the foyer, the cheery dining room features cathedral ceilings and plenty of natural light. Beyond the dining room, you will be delighted by the nicely updated kitchen, complete with an abundance of white cabinetry, granite counters, a neutral backsplash, and stainless appliances. The breakfast area opens up to the generously sized living room, which features a gas logs fireplace. Through the French doors in either the living room or the breakfast room, access the amazing all seasons room that is perfect for entertaining or enjoying the gorgeous view of the private backyard. The master bedroom is tucked away, quietly, beyond the breakfast room for plenty of privacy. It features a trey ceiling, windows overlooking the backyard, and a master bath with a huge, updated tile shower. A walk in laundry and half bath are situated beyond the kitchen. Located on the opposite side of the home are 3 additional bedrooms and a full bath. A large workshop space is located in the garage. A new architectural shingle roof was installed in 2014 and a new HVAC unit installed in 2011 with an extended warranty through 2021. The home is currently equipped with a wheelchair accessibility ramp that can be removed at the buyer&apos;s request.